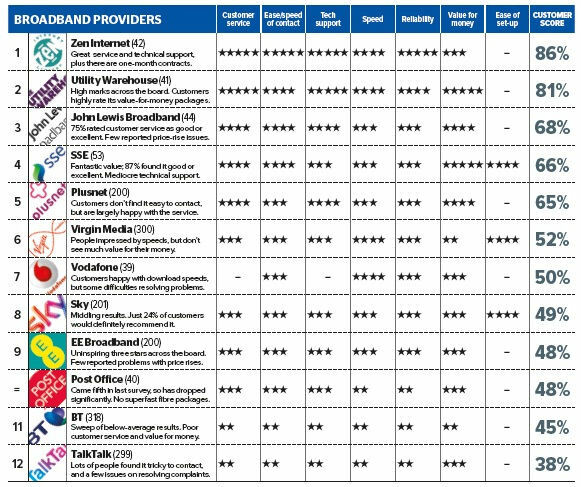 UK consumer advocate Which has published its latest broadband customer satisfaction survey and all the biggest ISPs scored poorly on customer service. Which surveyed 1,800 people in November and December 2016 and summarised its findings in the table below. The final score represents the proportion of customers so satisfied with their provider that they would recommend it to others, and their opinions of specific features of the service are shown in the star ratings. A dash means there were less than 30 responses. At the bottom of the customer score list is TalkTalk, indicating two thirds of its customers wouldn’t recommend the ISP. Dominant infrastructure owner BT doesn’t fare much better and got two stars across the board for the features of its service. Other big providers including Sky and Virgin only managed to get a positive endorsement from half of their customers. On the flip side smaller providers Zen Internet and Utility Warehouse scored highly in every respect and even BT-owned Plusnet seems to perform much better than its parent, which makes you wonder why BT doesn’t just ask Plusnet how it’s done. None of the major players got more than three stars for customer service. Tags: broadband, BT, PlusNet, TalkTalk, UK, Which?